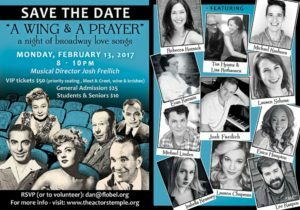 NEW YORK –– An Evening of Broadway Love Songs benefiting the historic Actors’ Temple, a New York City-based synagogue and Off-Broadway Theatre Space will take place on Monday, February 13th from 8-10 pm at The Actors’ Temple, 339 West 47th Street. As The Actor’s Temple begins to celebrate its 100th anniversary, the special Evening of Broadway Love Songs serves as the kick-off event to help raise funds for the construction of an ADA-accessible restroom facility at the Temple/theatre building as well as to raise awareness of its history and upcoming centennial. A presentation of The Florence Belsky Charitable Foundation (Flobel), the musical evening’s host will be NYC-based theater director, actor and performance coach Lee Kasper; with multi-talented composer, arranger and pianist Josh Freilich as Musical Director and FloBel Executive Director Daniel Schneider as executive producer. Joining them will be a cast of talented performers; friends from the Broadway community, the French Woods Festival of the Performing Arts and beyond. Tickets for the benefit range from student prices to VIP level; $10 to $50, with a post-show VIP after-party. To purchase tickets visit: http://ActorsTemple.flobel.org. The February 13th kick-off event is designed to connect the next generation of artists with those who helped build Broadway and the American entertainment industry. In addition to raising funds, a primary purpose of the evening is to renew the Actors’ Temple and Theatre Space’ tradition of being a meeting place for young and old performers from throughout the world, who have chosen to make NYC their home. WHAT: An Evening of Broadway Love Songs Benefit for the Historic Actors’ Temple & Theatre Space, a kick-off event celebrating its centennial to raise funds for construction of an ADA-accessible restroom facility. The evening will connect next generation of artists with those who helped build Broadway and the American entertainment industry — renewing the 100-year-old tradition of serving as a meeting place for performers from around the world.